Ready to hunt? First, Show me your data! Nowadays, Threat Hunting is a very popular topic among not just security practitioners in the InfoSec community, but also organizations that are looking to take their security posture to the next level. 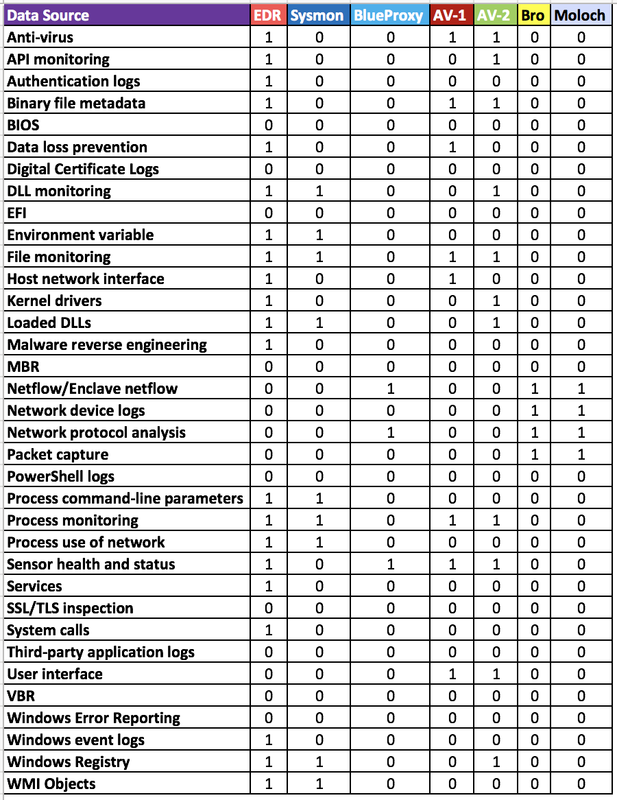 Several great hunting resources have been shared that provide complex queries and methodologies that facilitate the detection of techniques used by real adversaries. Some have even shared maturity models and explained how important data, tools, and skills are when building your hunt team. However, only a few resources have gotten into the details of how to really start your program and develop metrics to track the effectiveness of the hunt team from day one. A few months ago, I blogged about "How Hot is Your Hunt Team" where I examined the MITRE ATT&CK framework in the form of a heat map in order to measure the effectiveness of a hunt team, and loved the way the community embraced it. That was my first attempt to share the basics of putting a number to hunt team effectiveness while validating the detection of techniques defined by the ATT&CK framework. Even though the score definitions were very subjective, the main purpose of the post was to provide a basic approach to measure the current state of a hunt team program. 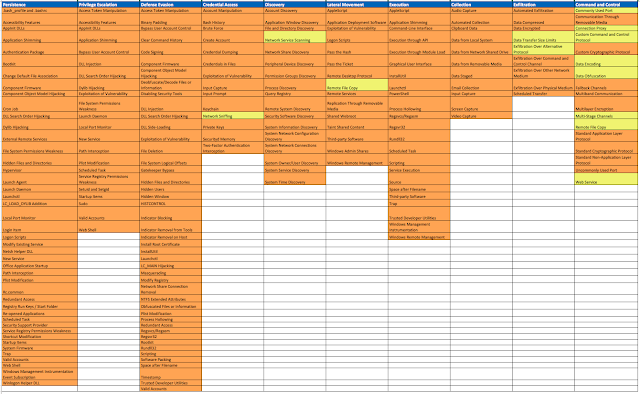 In this post, I wanted to take my current heatmap sheet/approach and go a little bit deeper on one of the main factors of a hunt program that, in my opinion, should be assessed and measured before your first engagement: "Data." I know you want to start hunting (do the cool stuff) and show/learn all the different ways to find evil; however, without the right data quality, it is very hard to focus on the mission, be productive, and hunt effectively. One definition used the most about data quality is from Joseph M. Juran, author of Juran's Quality Handbook, who quoted, in page 998, "Data are of high quality if they are fit for their intended uses in operations, decision making and planning." In other words, if data needed for a hunting engagement does not meet specific requirements defined by the hunt team, then the data is not considered quality data since it is affecting the intended purpose of it. I liked how Stephanie Zatyko from "Experian Data Quality" defined it by saying that if data was water, data quality ensures water is clean and does not get contaminated. Reduce the time hunters spend fixing and validating data issues increasing productivity during hunting engagements. Improve consistency across data sources to manipulate data more efficiently allowing more complex analytics that rely on several resources for extra context. Why do I have to care about Data Quality? That’s not my job! You might have enabled CommandLine auditing via GPO but not being applied everywhere or simply not working properly. Does it affect the quality of your data to hunt? if so, is that a Data Governance problem? "Message" fields containing extra information needed for stacking purposes, but not available. 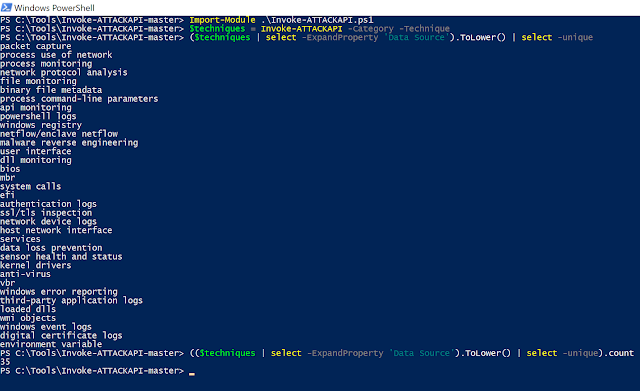 Great example is my post about "Enabling Enhanced PowerShell Logging ..". Timestamps reflect only ingestion time and not actual creation time, and data is only available for a certain period of time. What if, your endpoints stop sending logs to your SIEM after disconnecting from the network. Next day your SIEM gets several alerts on events from several systems that are 24 hours old, but the main timestamps show that the events happened earlier in the morning. Endpoint data is only available from high value targets and for a week only. 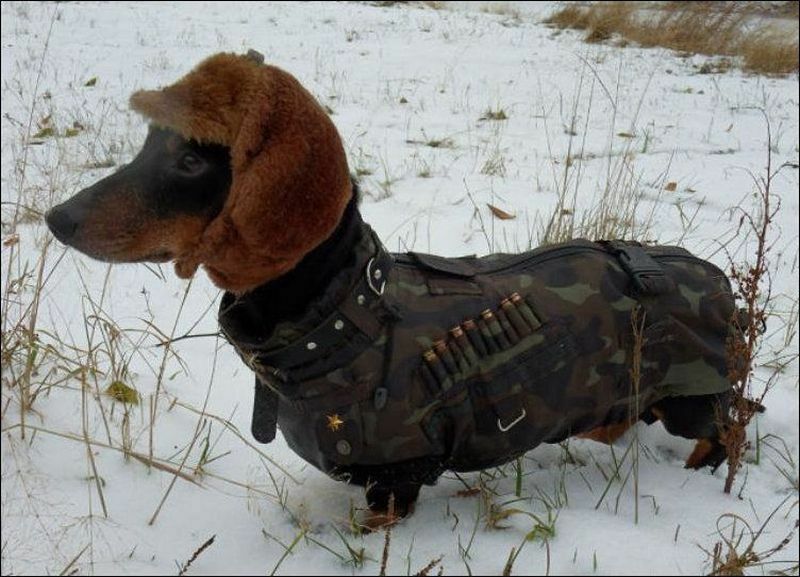 You are ready to hunt and realize that you can only hunt in certain parts of your environment because your company only purchased/configured only parts of your network to send data back to your SIEM. Did it sound familiar? The idea here is not to do the job of a governance team, but to guide them in the right direction and provide recommendations. You are the security subject matter expert after all. I hope the basic examples above made you think a little bit about why you also need to care about how the quality of your data is assessed/measured when getting ready for a hunting campaign. I might be doing that already.. Even if you have been already sending emails to your data governance team about similar issues, do you track what aspects of your data quality are affecting your hunting engagements the most? How do you categorize those issues and focus on what is most important? This is where data quality dimensions are super useful to start understanding how to measure the quality of your data. Used to simplify the representation of measurable characteristics of data quality. There are several data quality dimensions defined out there that are useful, depending on the intended use of the data. However, for data that I need for a hunt program, I like to reference a few data quality dimensions from the "DoD Core Set Of Data Quality Requirements." A few of those Data Quality (DQ) dimensions could help your team categorize gaps found in data intended to be used for hunting purposes. I will explain in a bit which dimensions are very helpful to measure the effectiveness of your hunt team from a data perspective. 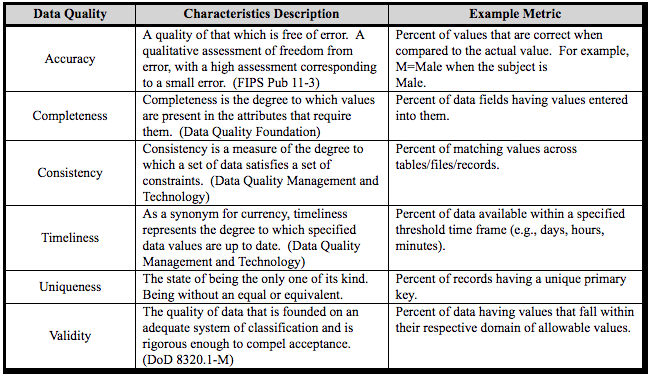 For now, let’s get familiar with the ones provided by the DoD (These are just general definitions of data quality dimensions. We will adapt those definitions to our specific data). Figure 1: DoD Core Set Of Data Quality. Figure 4: Using Invoke-ATTACKAPI to map tactics and techniques to data sources recommended. It is time to identify the data sources that you have. One way to expedite this process is by looking at the tools that your organization has purchased or configured to give you the data that you are currently working with. For example, instead of coming up with data source names, such as the ones from MITRE, I recommend starting to document the tools that are present in your environment such as, for example, Sysmon, OSQuery, Moloch, AV, Bro, EDR solutions, etc. Take each data source needed and ask this question about each of the tools you have: Is this tool providing the data source I need? With a binary system, you can mark each with a 1 or a 0 depending on your answer. Don't focus on how well or how much the tool is giving you, per data source (DS). Those aspects will be addressed while measuring the quality of your data. One example I have is shown in Figure 4 below, where I put together a table with data sources from MITRE ATT&CK on the left and tools on the top as column names. Remember this is just an example and the numbers just represent a Yes or a No for now. After adding Data Quality measurements, your numbers will change. This is just to start at least having an idea of where you might be from a data availability perspective. Figure 5: Data that you have mapped to what you need. Figure 6: DQ Dimensions Definitions and Examples. Figure 7: DQ Scoring Table. In order to get a full score per level and move to the next one, you have to comply with all the requirements of the specific level where you currently are at. For example, in Completeness, if you have 100% endpoint coverage from a data source perspective and 75% of required data missing then your score in Completeness will be 1 and not a 5. Not just because your tool is deployed everywhere, it gets a high score. This is very important to remember. Each level requirement must be defined by your team. I am just providing examples and just basic ideas. My examples might not be detailed enough for you or your team. If you have better requirements and would like to share, let me know and I would encourage you to submit a PR in the ThreatHunter-Playbook project. I will appreciate it a lot! 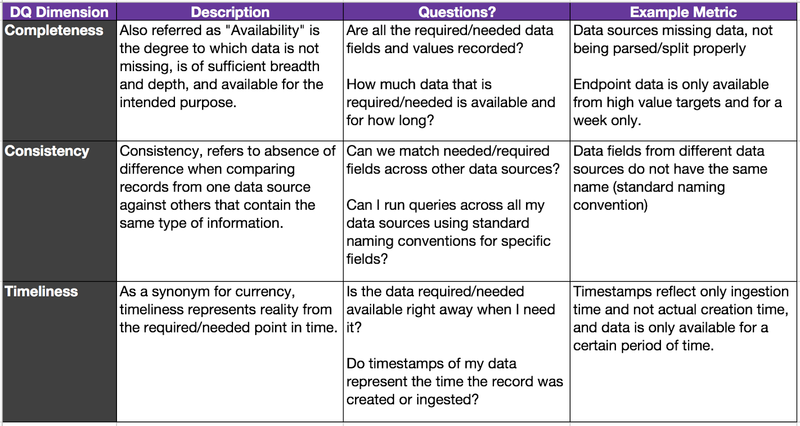 If you think that other Data Quality Dimensions apply to your data, feel free to add them to the table and define the requirements for it. Consistency and Timeliness are measured across all your data sources at once and not individually. This is the case when you have your logs in a centralized location and managed from there (ELK, Splunk, EDR, etc.) Therefore, when you set the scores for Consistency and Timeliness, make sure you remember that the scores could be the same across all your data sources if you are sending everything to a SIEM. You don't have to be 100% right on your answers. Going very deep into the specific details of the quality of your data might take longer than you think. The idea here is to start understanding your data from a high level perspective and start conversations with the team in charge of maintaining your data (internal or external parties). Now that you have your data quality dimensions defined and a scoring table ready, you can start showing some value. First, do you remember that we created a table to show how many required data sources were being provided by your tools purchased or configured in your organization (Figure 5)? 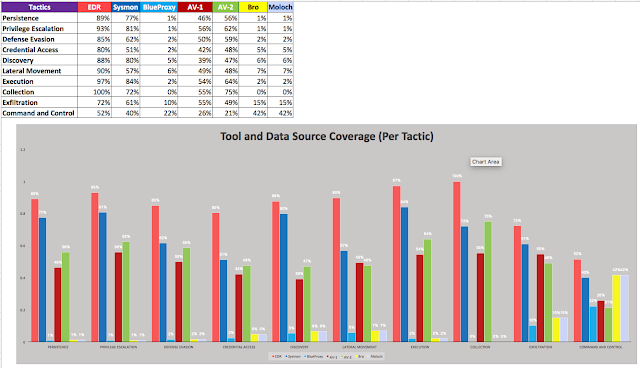 Based on that table, you can draw some conclusions from a DATA SOURCE COVERAGE PERSPECTIVE ONLY on how much your tools will help you during hunting engagements. Since you have a tool mapped to specific data sources, then you can use again the Data Sources field from each technique in the ATT&CK Framework and calculate the percentage of the data sources provided by your tool from the number of data sources recommended. Figure 8 : Percentage of DS provided by your tools per technique. You can see that your EDR solution looks to be doing better than your other solutions since it provides more data sources than what you other tools are capable of or configured to do so. However, you should NOT take that score as your final score when doing an inventory of your tools and asking yourself, “What tools are helping my team to hunt specific techniques?” I have seen tools being mapped to the ATT&CK Matrix in recent presentations and I don't see much value on just saying that they help because they give you the required data (my opinion). Another misconception that might be created from Figure 8 above is that your EDR solution seems to have similar scores with open source tools such as SYSMON. 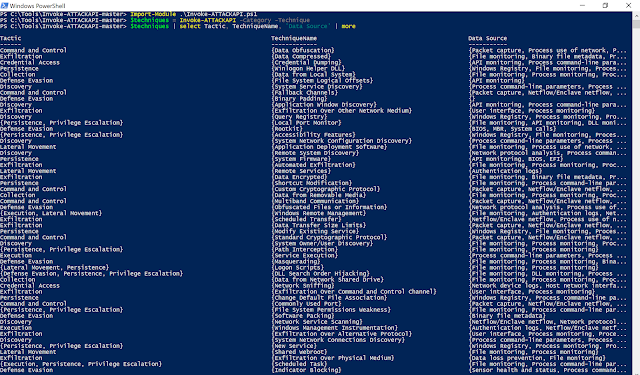 Here is where you might have people saying: Why do I need to buy EDR when I have SYSMON? I can see the 100% in both when it comes to detect "Data From Local System" so why buy? (don't get me wrong both have their pros and cons. I just don't like to make decisions based on the data that the tool says it provides). Sysmon works with Exclude and Include rules. The moment you exclude something that is being used to perform the specific technique, you get zero value from the tool (for targeted detection). Once you take the percentages per technique and tool, you can then create bins to organize your results (0-20, 20-40, 40-60, 60-80, 80-100). You will be able to see the numbers of techniques mapped to the percentage of data sources provided by each tool as shown in Figure 9 below. Figure 9: Number of techniques where tools seem to have great coverage. 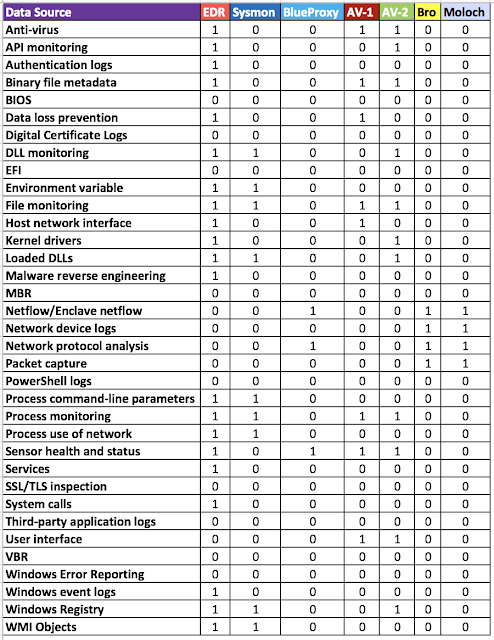 Your EDR seems to be the most effective tool to use when hunting for 134 techniques out of the 169 defined in the ATT&CK Framework. Without the extra context that I will show you later with DQ dimensions, that number does not mean much to me. I can see that my network tools are not doing well and it is because there are more techniques calling for host rather than network logs. However, you know that network and host complement each other. I just would not use my Moloch tool when I am looking for Credential Dumping activity and my traffic is encrypted. I can see also that my SYSMON configured in a certain way, it is not going to help me as much by itself. I will need to correlate the data with other tools to be more effective. Then, what does it look like from a Tactics Perspective? Figure 10: Number of tactics where tools seem to have great coverage. The graph above is basically now showing you the coverage but per tactic after grouping each technique with its specific tactic. 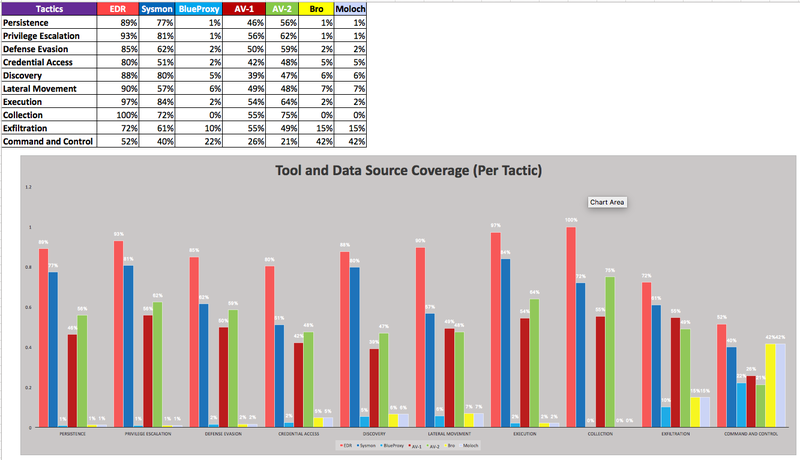 A very useful graph for when you want to see your full coverage from a DATA SOURCE AVAILABILITY ONLY perspective per tactic across all the techniques that ATT&CK defines. Figure 11: Current view considering availability as the only requirement for a data source. I created a table where I got rid of the binary system scoring and started using the table scoring from Figure 7. I went over each data source per tool and started measuring the quality of my data. A vendor tells me that the tool I am purchasing provides registry monitoring, and that it automates the collection of AutoRuns. However, during the POC I find out that it is missing several registry locations identified by my team to start hunting for persistence. By measuring the completeness of the data, I can tell that the quality of the data I am getting from a commercial tool is not going to help me much to validate the detection of several persistence mechanisms. 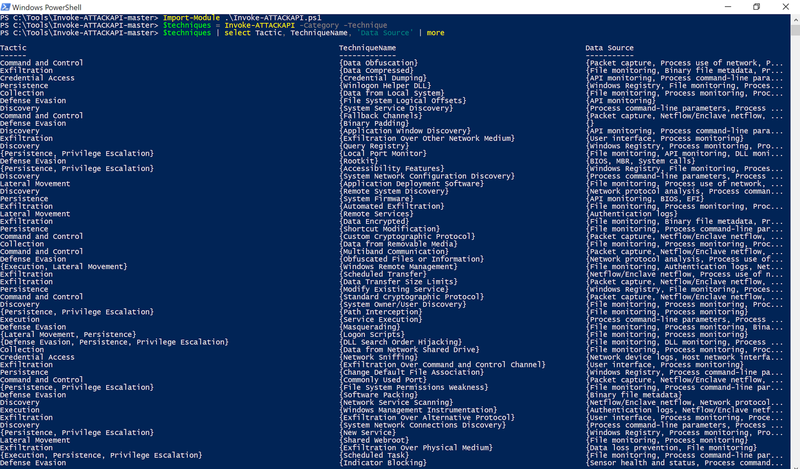 Sysmon is configured to collect loaded modules events (EID 7), but due to the high number of events generated, its config is cut back to only monitor 5 specific modules/images. By limiting the number of information being collected, it also limits the detection capability for techniques calling for DLL monitoring. 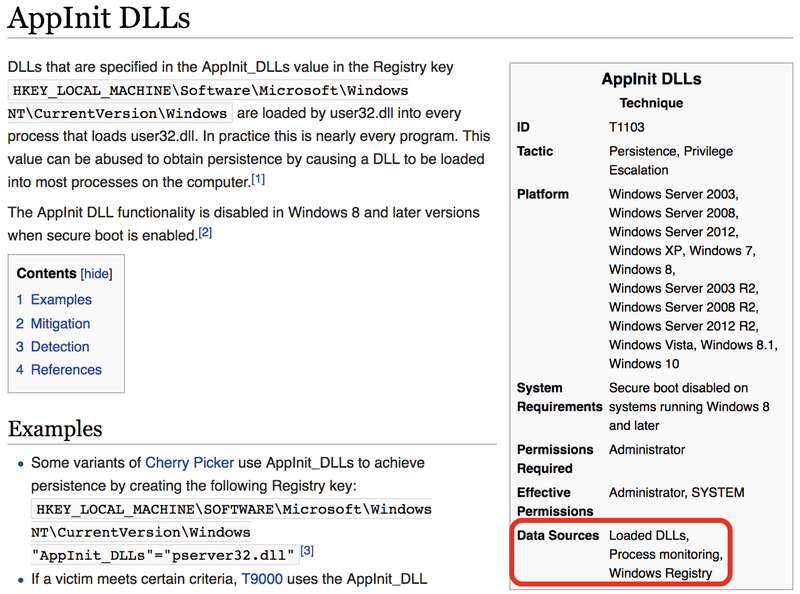 Not just because you set your Sysmon config to include a few LoadedImages and collect that data, you are satisfying the "DLL Monitoring" required data source. Sysmon gets configured to pull every single hash type capable to calculate, but it is all pushed into one field named “Hashes” (by default). You are also collecting MD5 hashes from your AV data source. You want to run a query to stack MD5 hashes from both. 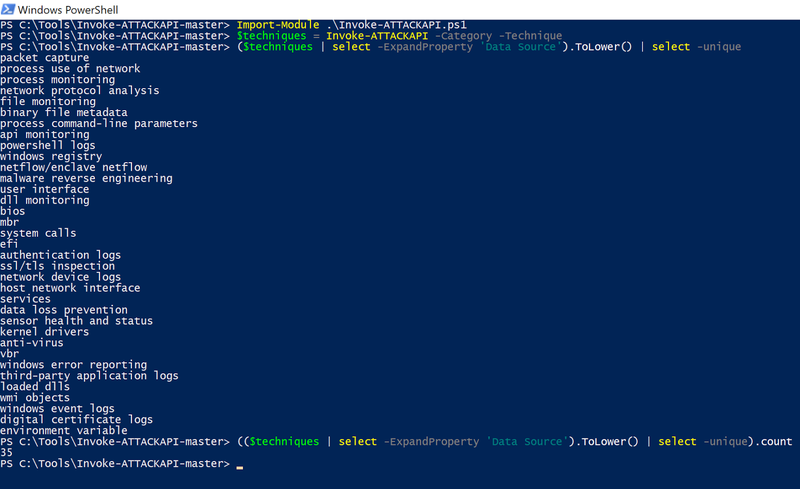 How can you stack the values of a specific hash type across those two data sources when every hash type in Sysmon gets populated under one field?. You can use regex, but it can add extra load to your server and time to your engagement while trying to figure out a workaround. That is not a good example of good Consistency. Also, I calculated the average of each tool and the Max values of Data Quality overall per data source. One final thing to notice, too, is that for my EDR tool, I applied a different score under Consistency and Timeliness from the rest of the data sources. This is because usually when an organization buys an EDR solution, it usually comes with its own infrastructure and standards for our specific DQ dimensions. How do I add that to my overall score? I updated the HuntTeam_HeatMap's Score Defs sheet with the new DQ dimensions scoring definitions in order to improve the current ones, and get a little bit closer to a more realistic score. Next, after also considering talent and technology for our overall score, you can automatically start generating an overall score based on an average score from (Data Quality, Talent & Technology). The HuntTeam_HeatMap document in the ThreatHunter-Playbook performs those calculations automatically for you and replaces the final number with the score label. Figure 14: Updating overall score with new scoring definitions. What does our heat map look like now? Considering the numbers that I see as my final data quality ones, I can tell that my numbers are looking Fair (not as "Good" as how the availability score was making it look like, but Good/Fair, mostly Fair overall). This is also because I graded talent and technology a 3 (Good scores). Figure 15: Looking at the current scores across my ATT&CK Matrix. Now what if I reduce the score of my data quality and technology to Poor and leave the talent at Good? You can see that the effectiveness of your hunt team to validate the detection of adversary techniques went from mostly Fair and a little bit of Good to Poor overall. You might still have good good talent whom can put together a few scripts and start scanning your network, but it is not enough. You need good data quality and the right technology. I hope this was very helpful for those trying to create metrics around the quality of their data, add it to their overall score, and willing to do the respective pre-hunt activities to hunt more effectively and efficiently. 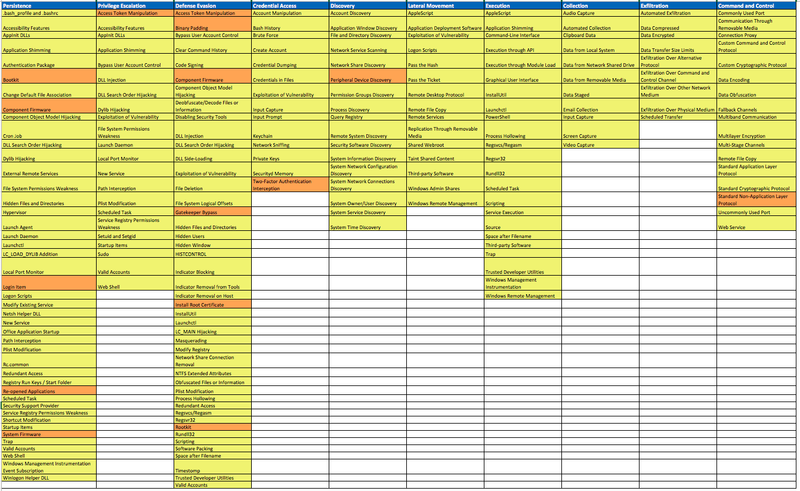 You can find the link to the updated HuntTeam_HeatMap below. I would love to hear your thoughts on these new metrics, and if it is helpful to start creating your own.